Asus Zenfone Max Pro M1 will be available for purchase today at 12 PM on Flipkart as part of e-commerce portal’s Big Shopping Days. Usually, Asus conducts the sale of Zenfone Max Pro M1 every Thursday, but as mentioned, the sale is part of the Flipkart Big Shopping Days where other smartphones such as the Xiaomi Redmi Note 5 Pro, Redmi 5A are also made available for purchase. 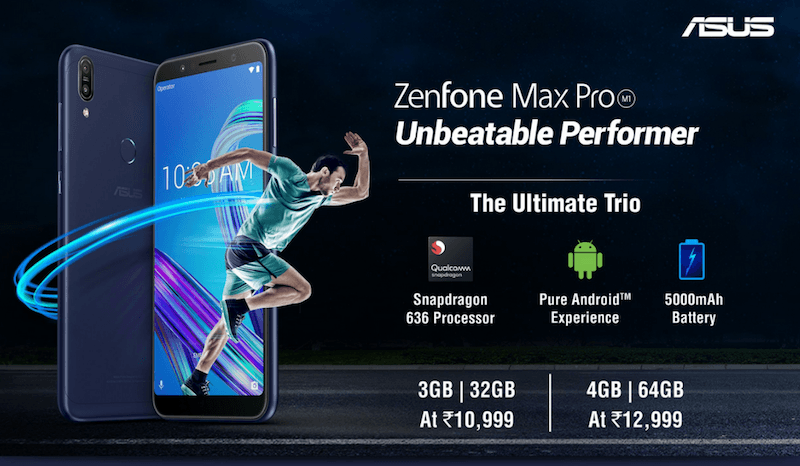 As seen since the very beginning, the 3GB RAM and 4GB RAM variants of the Zenfone Max Pro M1 will be available for purchase during today’s sale as well. The 6GB RAM variant with upgraded cameras could be available starting next week as Asus mentioned the new variant would be up for sale this month itself. As you might be aware of, the smartphone will be available at Rs 10,999 for the 3GB RAM+32GB storage variant and Rs 12,999 for the 4GB RAM+64GB storage option. Both the variants can be picked up in two colour options- Black and Grey. Speaking about the offers during the Flipkart Big Shopping Days, the e-commerce portal is offering an instant 10% discount on SBI Credit cards, 5% off with Axis Bank Buzz Credit Cards. Alongside the bank offers, users can also purchase the Max Pro M1 via exchange. Flipkart is providing Rs 10,000 off on 3GB RAM variant if a customer exchanges their old smartphone, while the 4GB RAM variant gets a discount of Rs 12,000 on the exchange. Lastly, Flipkart has come up with a new rule that a user can purchase only two units of the Zenfone Max Pro M1 every 30 days. The Zenfone Max Pro M1 is the company’s first device to boot stock Android out of the box. The phone comes laden with Android 8.1 Oreo out of the box, and it’s powered by the Qualcomm Snapdragon 636 SoC. Asus launched the device in two variants- 3GB+32GB and 4GB+64GB variant, and the third variant with 6GB RAM and 64GB of internal storage is coming soon. On the front of the phone, we have a 5.99-inch Full HD+ display and the connectivity options on the handset includes 4G LTE, VoLTE, Wi-Fi 802.11 b/g/n, Bluetooth, GPS and a Micro USB port. Another area where the Asus Zenfone Max Pro M1 shines is the battery life as the phone boasts a 5000mAh unit under the hood. The phone has a 13MP+5MP cameras on the rear side and an 8MP shooter is present on the front side. Asus never gives service to flagship phones… Pls dont purchase.